imagine components defined like Processing sketches, so you're never constrained by what comes built-in; imagine forking components or creating new ones all while your project is running. The Aziz! Light Crew Freeliner is a live geometric animation software built with Processing. The documentation is a little sparse and the ux is rough but powerfull. Also known as a!LcFreeliner. This software is feature-full geometric animation software built for live projection mapping. Development started in fall 2013. It is made with Processing. It is licensed as GNU Lesser General Public License. A official release will occur once I have solidified the new architecture developed during this semester. Using a computer mouse cursor the user can create geometric forms composed of line segments. These can be created in groups, also known as segmentGroup. To facilitate this task the software has features such as centering, snapping, nudging, fixed length segments, fixed angles, grids, and mouse sensitivity adjustment. 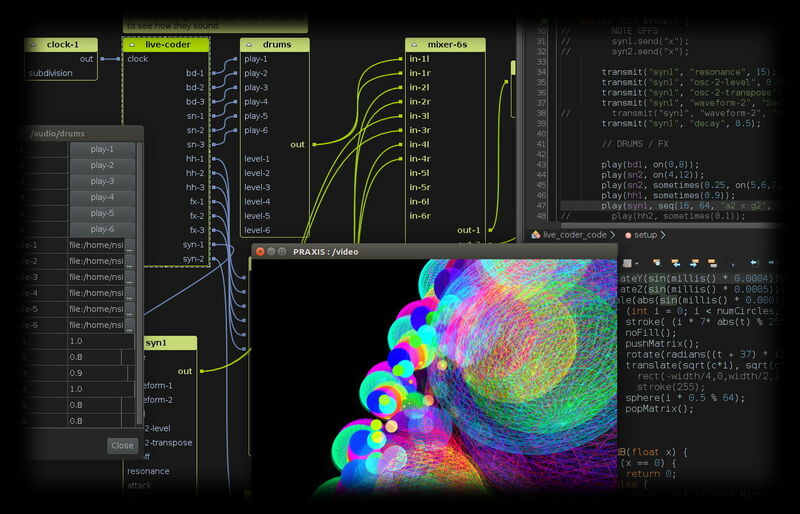 GAmuza is an Hybrid Live Coding/Modular application, for interactive design developing, live audiovisual performance and generative art teaching. The main core of GAmuza is a live coding environment for rapid prototyping, playing and learning. Based on Lua embeddable scripting language, Luabind and ofxLua OF addon, extends the OpenFrameworks API (0071) with different input/output setting modules easy configurable within a GUI. GAmuza works with various GUI modules. Every active module will be available, with all his output variables and functions, within the GAmuza live coding environment. An interactive tool that depicts the 500 companies on Fortune Magazine's annual list of America's largest corporations. RemoteVLC is an external library which allows you to communicate and control VLC Media Player remotely from the processing environment. Processing has memory issues in handling videos. I setup a public netvibes page. It's the latest news, links, images, videos about Processing, Openframeworks, VVVV, EyesWeb, Isadora, Quark Composer, Pure Data, Max MSP. HasCanvas : HasCanvas is a tool for creating and sharing Processing sketches and runs on John Resig s Processing.js. sketchPatch allows people to play with programming in a easy and fun way. You can write your own programs and run them in the browser, share them, or collaborate with other people making new versions of their programs. HasCanvas is a tool for creating and sharing Processing sketches and runs on John Resig s Processing.js. This book teaches you the basic building blocks of programming needed to create cutting-edge graphics applications including interactive art, live video processing, and data visualization. it reads the xml files that are being stored by the MSN, and makes a graphical display that allows to make comparisons between conversations with different people..
OSCemote is a remote control application for the iPhone and iPod Touch. It lets you send Open Sound Control messages to other programs like Max/MSP, Puredata, Eyesweb, Processing, etc. SMSLib is a Java library for sending and receiving SMS messages via a GSM modem or mobile phone. It also supports some bulk SMS operators, by implementing their HTTP interfaces. Ce qui suit decrit de maniere sommaire les instructions utilisables dans l'environement de developpement Arduino. Artista multimedia e Ingeniero en Sistemas de Informacion (U.T.N.). Integrante del grupo Proyecto Biopus ( www.biopus.com.ar ), primer Premio MAMBA/Telefonica de Arte y Tecnologia 2006. Prototype: Interaction design Cluster / Yaniv Steiner : A constantly updated gallery of interaction projects for you to explore the world of interaction and the people involved. Manuel de reference Arduino : Ce qui suit decrit de maniere sommaire les instructions utilisables dans l'environement de developpement Arduino. A particle system physics engine for processing. Just a simulation, it tells you where particles are and it's your job to draw them. No collisions, you can take care of them yourself if you want! This is the repository of processing applets created by Marcus Graf. links for PD (Pure Data), Supercollider, Max/MSP, Analog to Digital Interfaces, OSC protocol, ChucK, Python, Java, Director Xtras, processor art, music software.